The Aran Sweater is the most popular item sold at our store. The Aran Islands lie on the most westerly edge of Europe, across the mouth of Galway Bay. Fishing and farming are the main industries on these islands and there is a great need for warm, protective clothing. Anne O’Maille employs 170 knitters, from remote regions in Connemara, west Clare, and north Mayo. Oiled, unbleached wool is homespun and knitted by the island womenfolk, to create warm and enduring garments, to protect against the harsh Atlantic conditions. The patterns incorporated in traditional Aran hand knitting have been handed down from mother to daughter for generations. These knitting designs symbolise the daily life of the islanders, their remote surroundings, and their religious beliefs. Each garment incorporates stitches representing age-old Irish traditions and culture. Cable stitches represent fishing ropes. The plaited cable stitch evokes the powerful imagery of the interweaving of family life. Moss stitches represent the rich and abundant growth of the mossy soil. Diamond stitches signify the shape of the fishing net mesh, a symbol of wealth and success. Honeycomb stitches represent the rewards of a good life. 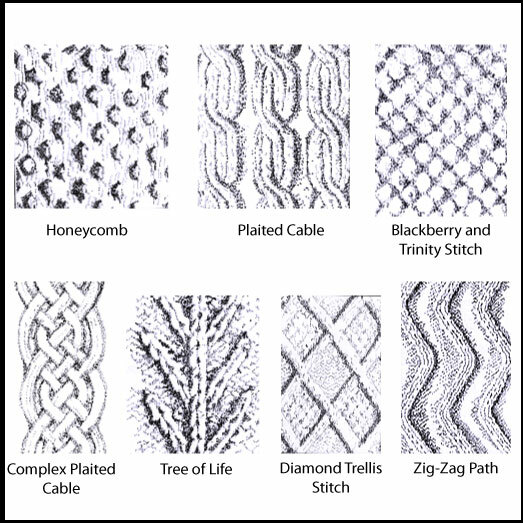 Trinity stitches represent ancient and religious beliefs. Blackberry stitches have religious and natural connotations. Stitches such as lobster claw, spoon and basket are symbolic of the way of life of the knitters.